Fruits4Real is an online casino and this multi-vendor casino is operated and owned by Dialinvest International N.V. This online casino is licensed and regulated by the laws of the Government of Gibraltar, and the Government of Curacao. The website is designed with a fruit slots theme and it contains a large range of fruit slots, video slots, jackpot games, table games, and more. That did sound quite promising so we had a more detailed view on this casino in our Fruits4Real test. The Fruits 4Real online casino offers a variety of games, ongoing promotions, 100 percent safe environment, and fast withdrawals. It offers a mobile-friendly platform along with themed sliders and quick drop-down menus, flexible filters and categories. It also offers beautiful background and while searching the game titles you can enjoy the scenery and the best thing is you will be invited to try summer or Winter games. You don’t need to download the app on your mobile phone and it is compatible with both Android and iPhone. The players who play real money games need to register at the online casino’s website to open an account. 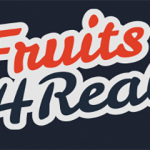 Fruits 4Real is an official online casino and it is considered a fair gaming website that features smooth and diverse operating platform for players. The casino lovers can enjoy playing their favorite game on mobile phones and desktop. The Fruits4Real Casino games are provided by the industries top game software companies including Betsoft, Endorphina, Gamomat, Amatic Industries, Wazdan, and Stakelogic. According to players’ reviews, the Fruits4Real is the best online casino and it offers the best and committed customer services. You are sure to enjoy the games and you are assured to have the best experience playing at the online casino. 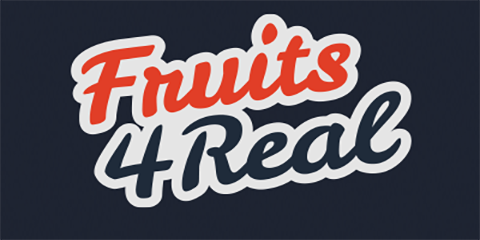 Fruits4Real offers the best bonuses for all new players. At Fruits4Real, players are allowed to select from a large selection of promotional offers and bonuses. 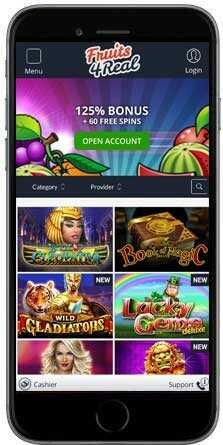 That includes a lot of unique offerings like first deposit bonuses, second and third deposit bonuses which all include gratis spins. 125% bonus up to 125 Euro + 60 free spins as first greeting. So if players want to get the full bonus, they have to deposit 100 Euro and get 125 Euro bonus directly and automatically added to the balance + 60 free spins. Because a deposit is needed to get the free spins we do not list Fruits4Real as no deposit bonus casino. The second Fruits4Real bonus for the second deposit consists of a 50% bonus up to 125 Euros. The player receives half of his deposit amount for free. 250 euro would have to be deposited to get the entire 125 euro bonus. In addition the player get 20 freespins. The third deposit is the same offer as the second bonus. Also with the third deposit the new member can get 50% up to 125 euros + 20 free spins. Also, the players can select freespin offers and restricted time offers. Players are requested to read the terms & conditions, the wagering requ of each and every promotional offer to assure compliance. As per the bonus rules, the normal betting requirements is forty-times, or as per the provided instructions. 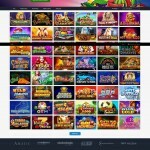 Virtual Games: Fruits4Real online casino offers a large selection of video slots provided by the most popular gaming software suppliers in the industry such as Betsoft, Endorphina, Stakelogic, Amatic, Wazdan, Oryx Gaming, etc. Most of these online casino games contain different themes and amazing bonus features that allow players to get a lot of advantages. The most popular games include Lost Slot, Muertos Slot, Dia de Los, Alkeor’s Tower slot, and Magic of the Ring slot. Fruits4Real casino games are separated into four categories including Fruit Slots, Video Slots, Table Games, and Jackpots. By default, the casino’s games lobby shows the entire collection of games that allows you to find your favorite games using the drop-down menu that contains all accessible titles. 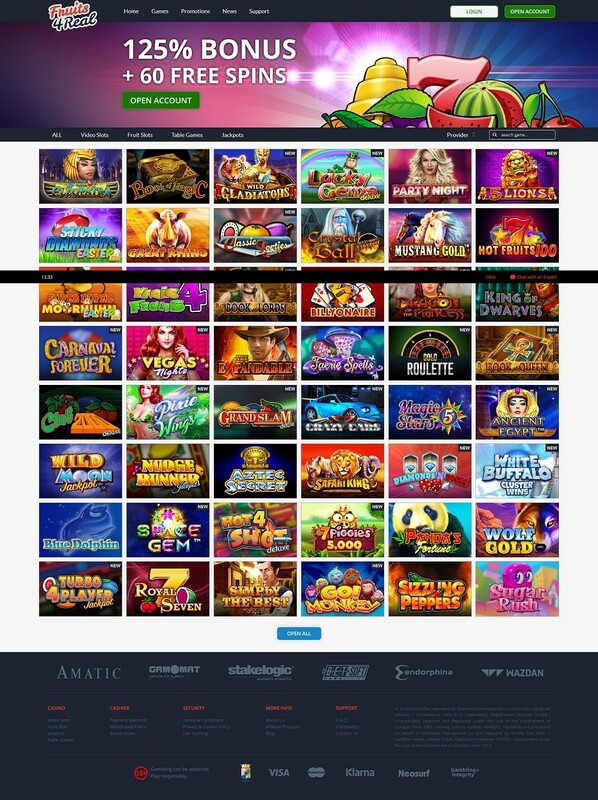 Also, the website allows you to narrow the selection and see only the type of games that you like to play the most like table games, video slots, etc. 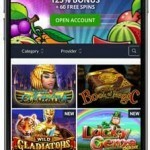 If you choose to play slot games, then you can find a lot of fruity-themed games that are closely connected to the main theme of the casino. You can also look for progressive jackpot slot and themed games available for the most experienced players. Even if you are a new player, you can still check your skills to win a poker game. However, the casino does not offer live casino games so you can’t enjoy playing tables games like blackjack, roulette, and baccarat. But, the free play mode allows you to play all your favorite games. At Fruits4Real online casino, table games are plenty to play, the website contains a large collection of Roulette Games, including American Roulette, European Roulette, and Zoom Roulette. Also, you can find a collection of Blackjack variants, including Single Deck Blackjack, European Blackjack, and Pirate 21 Blackjack, also find baccarat alternatives. Also, players can select different video poker games, including Oasis Poker, Ride’m poker, American Poker, and Caribbean Poker. Fruits4Real is a Bitcoin casino and also offers all other common best banking options to casino players. It offers secure, safe, and reliable payment options to players. The options include Paysafecard, Internet banking, Visa, Bitcoin, Skrill, Neteller, and Neosurf. The minimum deposit is 10 Euros and the maximum amount that you can deposit is 1000 Euros per transaction. You don’t need to pay any transaction fee related to these payment methods. Also, the banking process differs as per the country, and the entire casino games and banking structure is secured by SSL and all these banking options are easy-to-use. If players want to withdraw, then they must provide proper identification to confirm ID. Once the withdrawal request was processed, and if they want to cancel the process, then they have to wait for 24hrs to cancel the request. In general, withdrawals take ~1-3 hours via eWallet and between one to three business days to process and also it depends on the withdrawal method chosen. Fruits4Real online casino guarantees the top level of security. At this online casino, all financial dealings are executed in accord with the customary standards of internationally identified banking instructions and maintaining security, which is the top priority of the online casino. The website is secured as it uses the SSL encrypted technology to keep all your information safe and secure. The website allows you to search the game by provider or name of the game. Fruits4Real online casino can be accessed through Mac, PC, iOS, and Android. Excluding live casino games, all games are accessible in a free-play mode. To play the casino games on the website, you need to register but don’t need to download the games. Fruits4Real online casino website does not allow using the platform for players from restricted countries. The restricted countries include Cyprus, Belgium, Canada, Curacao, Italy, France, Denmark, Ukraine, Israel, Turkey, Slovakia, Serbia, Czech Republic, Mauritius, Philippines, Moldova, the USA, and the UK. Fruits4Real online casino offers the best customer support. It allows the players to enjoy professional and prompt services provided by the support team. Players can reach the team through phone, email, and live chat. Also, they can get access to all-inclusive FAQ section where the players can find answers for the most common question. Fruits4Real online casino offers a large range of games provided by the top software developers in the gambling industry. The prominent providers include Amatic, Endorphina, and BetSoft Gaming. All players are guaranteed to have an outstanding gaming experience and they can choose their favorite game from the huge selection of high-quality games. It is a fruit themed casino that offers fruit slots, video slots, and jackpot slots games and every player get an amazing gaming experience as the casino offers a large variety of games so that the players can choose to play their favorite casino games for a longer time. Also, the casino offers generous promotional and bonuses offer that add more excitement to new players and encourages old players.